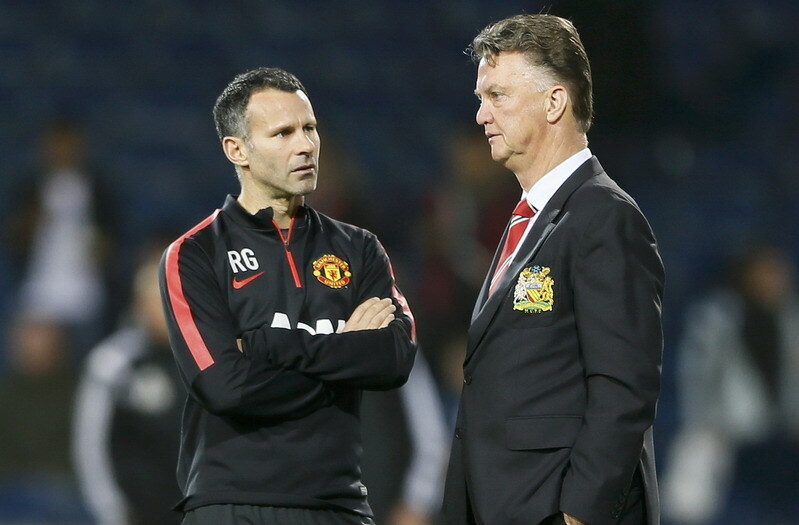 Manchester United manager Louis van Gaal (R) and assistant Ryan Giggs chat ahead of their team’s English Premier League soccer match against West Bromwich Albion at The Hawthorns in West Bromwich October 20, 2014. REUTERS/Stefan Wermuth (BRITAIN – Tags: SPORT SOCCER) FOR EDITORIAL USE ONLY. NOT FOR SALE FOR MARKETING OR ADVERTISING CAMPAIGNS. EDITORIAL USE ONLY. NO USE WITH UNAUTHORIZED AUDIO, VIDEO, DATA, FIXTURE LISTS, CLUB/LEAGUE LOGOS OR ‘LIVE’ SERVICES. ONLINE IN-MATCH USE LIMITED TO 45 IMAGES, NO VIDEO EMULATION. NO USE IN BETTING, GAMES OR SINGLE CLUB/LEAGUE/PLAYER PUBLICATIONS.